This tech is breaking world records in studying substances at atomic scales. Students at the Leiden University’s Institute of Physics have developed a new nuclear magnetic microscope (NMR) that is 1,000 times more sensitive than current NMR microscopes. Even more, the microscope can function at temperatures close to absolute zero. The new microscope, which would aid in capturing 3D images in atomic resolution, uses the same technology as magnetic resonance imaging (MRI) machines. The revolutionary instrument uses a thin wire and a small magnetic ball that causes a consistent magnetic field which then provokes the surrounding atomic nuclei to line up in the same direction. Next, radio waves are sent through the sample, causing some nuclei to flip the other way—giving away their positions based on the time it took for them to flip back again and generating an image mapping their locations. 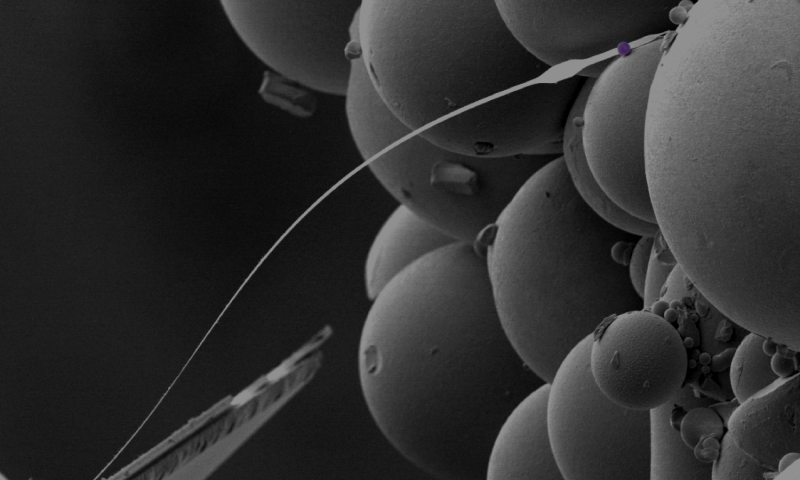 The new NMR microscope uses a thin wire and a small magnetic ball (purple). Leiden Institute of Physics. The ability of the microscope to work under extremely low temperatures presents another breakthrough in imaging atoms. He adds that even at room temperature, 0.0001% of the nuclei’s spins align while the rest behave chaotically. “By decreasing the operating temperature to 42 miliKelvin, we achieved a three-order magnitude higher percentage of aligned spins,” he explains. Just as NMRs made their way to hospitals in the form of MRIs, the technology is expected to open up a revolutionary window in the medical field. He admits, however, that it will take time before the technology is developed well enough, but that this would lead to far more non-invasive imaging that would yield more accurate observations, such as images of proteins exactly the way they are folded—without damaging or disturbing them in the process.